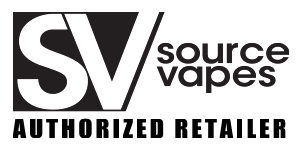 30% Off The new Source Orb 4 Signature Kit by Source Vapes takes portable dabbing to the next level. The Source Orb 4 Signature Kit has incorporated the superior power of the Source Volt Max 60 Watt Temperature Control Mod w/ a Removable Battery producing temperature ranging from 200F - 700F. With 60 Watts of pure sub-ohm power, the Source Orb 4 Signature Series Vaporizer offers a dabbing session which is unlike any other vapepen, eRig or Desktop Nail set up. 9 DIFFERENT WAX ATOMIZERS The latest version of the Orb (v4) has been re-imagined, and now features 5 variable airflow settings, a 2-piece magnetic design, and includes 9 retooled wax atomizers from Source Vapes. In addition to classic Source Vapes atomizers like the Quartz Single/Double Coil, White Ceramic Double Coil and Source's coil-less Ceramic Terra atomizer, the Source Orb 4 also includes new Source Nail coil-less Titanium and Ceramic atomizers, as well as Source's new Black Ceramic Double Coil Atomizer, which is equipped with porous ceramic rods that are ideal for low viscosity waxy oils. ORB 4 NEW FEATURES The Source Orb 4 Signature Kit is the most inclusive wax pen kit ever offered from Source Vapes. As always, Source is leading the way in wax pen vaporizer innovation, and the newly released Source Orb 4 is without a doubt one of the most powerful, versatile and practical wax pens available today. Some updates you'll see on the Orb 4 include new advanced atomizers, magnetic locking technology, stainless steel 303 construction, a new variable airflow system (VAS), as well as a powerful 60W temp control sub-ohm mod battery. 30% OFF WITH CODE "SOURCESIGNATURE"